When a team plays the top seed in the conference, it’s not going to be easy. The Colorado Avalanche learned that quickly in Game 1 of their first round series. 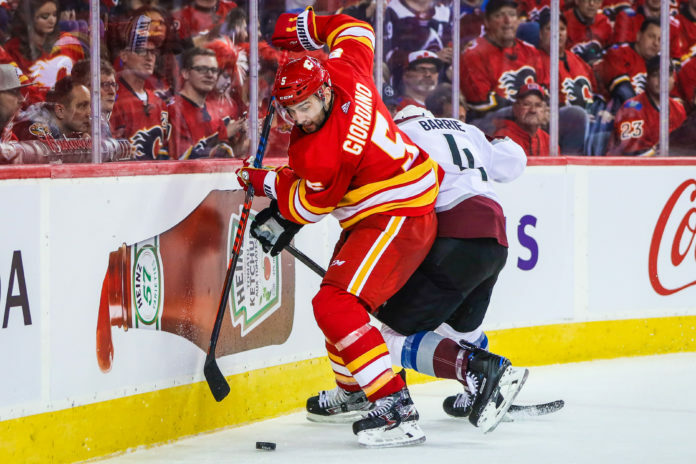 The Calgary Flames slowed down the Avs’ offensive game and pressured their defense into mistakes on the way to a 4-0 victory. Matthew Tkachuk, who wasted no time causing problems for the Avs blue-liners, picked up two goals and set the tone for the Flames all night. The contest was tight for the most part, but two goals by the Flames late in the second period were all they would need to close the door in the third period. Game 2 now takes on even more importance for the Avalanche, who don’t want to go home down 2-0 for the second straight postseason. Game 2 is scheduled for Saturday night at 8:30 p.m. MT. Matthew Tkachuk wasted no time showing the Avs why he’s the most effective troll in the NHL, and a superb player to boot. He got Erik Johnson to take a penalty extremely early in the game after the whistle, and he was effective on the forecheck all night long. On top of all that, he scored two goals, including a beautiful tip in front of Philipp Grubauer in the second period. Tkachuk is going to be in the Avs’ grill all series long and they can’t be tricked into taking penalties against him. The Flames forecheck caused problems all night long for Colorado’s defense. The Avs entire top-four (Zadorov, Girard, Barrie and Johnson) had major issues moving the puck at times and that helped slow down the Avs’ offense. Calgary is a supremely quick team that gets on their opponents immediately, so it’s something Colorado will need to be better prepared for in Game 2. Special teams are always important in the playoffs, but when a team gives up two power play goals and pick up none of their own, they’re not likely to win. The Flames were the clear victors in that battle in Game 1. The Avs had a few chances on their power plays in the second, but Mike Smith shut the door. Speaking of Smith, he makes a lot of standard saves look spectacular because of his style, but he played very well in Game 1. Calgary has more depth up front and on the blue line than the Avs, so if the home team now suddenly gets good goaltending, that’s going to be a major problem for Colorado. Smith made many solid plays with the puck, but also gave it away a few times and the Avs just weren’t able to capitalize. Mikko Rantanen did make his return to the lineup for the Avalanche, but didn’t look comfortable at all and certainly had some rust to shake off. He had the worst possession numbers among the Avs forwards, as they controlled only 37% of the shot attempts with him on the ice.